Grow hydrangeas almost anywhere; these delicate and brightly colored flowers are underrated hardy house and garden plants that can thrive in sun or shade. Hydrangeas are a vibrant, fragrant flower used in many professional outdoor gardens and indoor floral displays at hotels, conventions and events. Learn about hydrangea planting to best plan your hydrangea garden, whether it is in a bright, sunny patch or under the partial shade of a house or tree. Hydrangeas are flowering plants with delicate flowers that are usually blue, mauve, pink, red or white, and can come in the form of large, bushy clusters or small, dense houseplants. Whether in the sun or shade, hydrangeas are hardy and easy to care for as long as you keep them properly watered. Hydrangeas prefer an environment with some direct sun and partial shade. While hydrangeas will stand direct sun, they use up a lot of water in direct sunlight, which can prematurely dry the soil, causing the plant to wilt. Too little sunlight causes some varieties of hydrangea to grow long stems, contributing to a sparse and thin flower plant. 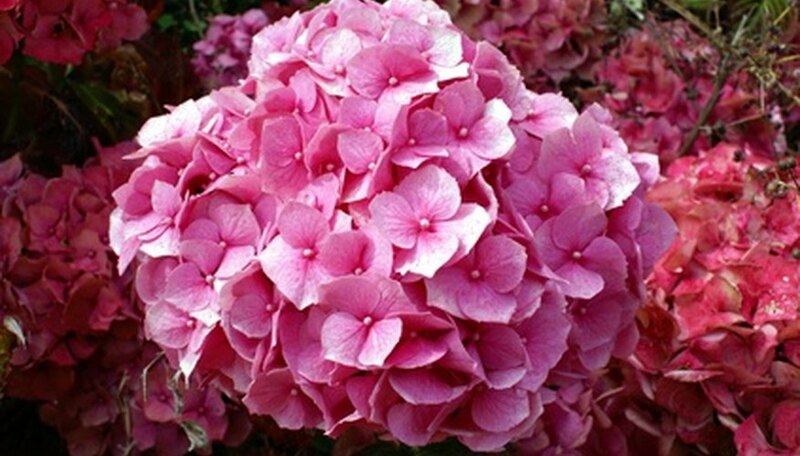 Types of hydrangeas best suited to grow in sun and shade include smooth hydrangeas, oakleaf hydrangeas and annabelle hydrangeas. These varieties of hydrangea are more apt to keep their shape in areas with almost complete shade. Give hydrangeas partial shade using natural shade from trees or by building a greenhouse or conservatory. A greenhouse for plants allows you to control the light, wind and heat for your plants. Shading a hydrangea plant using a tree or building can reduce how much you have to water the hydrangea and protect it from wilting. The brightest colored hydrangeas depend on proper soil pH and nutrient levels to show their truest hues. According to "How to be a Gardener" by Alan Titchmarsh, keep a pH of 4 to 5 for blue hydrangeas, 5 to 6 for pink or red hydrangeas and 6.5 to 7.5 to keep white hydrangeas pure white. Measure soil pH using a pH kit from a home and garden shop.